A total of 123 baby giant turtles have been stolen from a breeding facility in the Galapagos islands, a lawmaker from Ecuador's prized archipelago in the Pacific told AFP. "They were all taken at once, 123 in all. It was a robbery," Washington Paredes said by phone on Thursday. He said it happened Tuesday of last week. Galapagos National Park said it was preparing a statement on the alleged theft of the hatchlings from a facility on Isabela, one of the islands. Lumbering adult giant turtles are a beloved symbol of the islands that inspired Charles Darwin's theory of evolution. The Environment Ministry also said it would issue a statement when it had official information. Paredes complained that the breeding facility where the theft occurred was poorly protected, with no security cameras or light sensors. "The turtles are just there. If somebody wants to go in by night and steal, they can," he said. 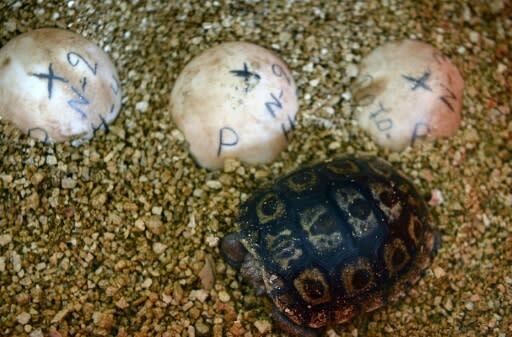 In June, 26 adult turtles that had been smuggled to Peru were returned to the islands. Twelve species of giant turtles live on the islands, which are a United Nations natural heritage site.